A remote-controlled floating drone could clean up excess algae and turn it into biofuel. The Baltic Sea has become a breeding ground for frequent algae blooms and this has lead to the accumulation of high levels of toxic algae, which could be dangerous to existing ecosystems. To help deal with this overabundant toxic algae problem, A Swedish design student, Fredrik Ausinsch, has developed a conceptual machine that is not only capable of eating the algae but his green technology also turns it into biofuel. 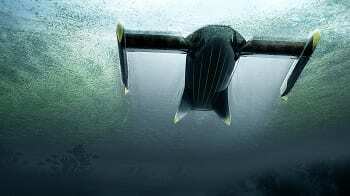 The drone would be designed with hydrogen fuel technology. Ausincsch’s innovative drone concept, which is called the Algae Sea Harvester, would feature hydrogen fuel cell technology. The machine would also be equipped with an electric-powered pump on each of its sides. The drone has been designed to function quietly as it operates and is capable of efficiently adapting to its environment. As it works, it releases water for thrust and discharges heat to dry the algae before consuming it. Basically, the environmentally-friendly machine would function somewhat like a vacuum, sucking up any algae located directly in its path. It would navigate through a specific area and visit a companion craft to empty its collected contents and to refuel its engines before heading back out for more algae. At present, the drone concept operates through remote control. The green technology could address several environmental problems. By removing excess algae from the Baltic Sea, the Algae Sea Harvester could reduce toxins and nutrients in the water, which would help to prevent the spread of anoxic sediments and result in improved fish reproduction. Such improvements would drastically improve marine and human life. Furthermore, it could harvest the collected algae and transform it into clean alternative fuel. In the future, if his invention becomes more than just a concept, Ausinsch’s green technology could actually help to clean up the Baltic Sea, improving the ecosystem of one of the most polluted bodies of water in the world.